Site of the grassy area, Saratoga Park. Image is from OBCDC website. There’s a movement afoot to change the name of “Saratoga Park” – that grassy area at the foot of Saratoga Avenue – and to have it named after Ocean Beach’s preeminent historian, Ruth Varney Held. Held wrote the local classic about OB – “Beach Town” – and also wrote a column for a local regional beach newspaper. Folks with the OB Community Development Corporation are developing a children’s play area within the grassy area and other elements such as an adult fitness are – and are pushing for the name change. Saratoga Park has been the name for the grassy area next to the sand and lifeguard parking lot for decades. Today, it sits in front of the new condo complex recently constructed with million dollar units. Saratoga Park shortly before opening of condo complex. The lengthy process to name or re-name a San Diego park ends up with the Park and Recreation Department and their list of strict requirements, and an OBCDC representative, Dave Martin, was there asking for the Planning Board’s support. Other OB groups such as the OB Mainstreet Association and the OB Community Foundation had lent their support for the name change. Ocean Beach would like to join many of the other San Diego beach communities that have a children’s play area adjacent to the ocean. …. … San Diego lifeguards and firefighters have suggested constructing an adult fitness area in Saratoga Park – a location these first responders often work out at without any equipment. … OBCDC is working on site survey, design and permitting costs of the children’s play area and adult fitness area on the site of Saratoga Park. The OBCDC has awarded the RFP to LdG Landscape Architects … to work on a preliminary design based off a public workshop held in 2014. This is all well and good. And any effort to change the name of Saratoga Park is all well-intentioned. But a snag arose when the matter came up for discussion and a possible vote by the Planning Board, Wednesday night, August 5th. When time for public input on the issue arose, community activist Barbara Houlton approached the Board. Barbara explained that she supports the children play area and exercise area, and that she supports the name change in theory. But, she added, she described her fear that if the park was re-named, it would lose certain protections. This land, she said, is dedicated park land, and currently it has a lot of protection. On October 15, 1964, the San Diego City Council passed a resolution that “dedicated” the park lands conveyed to the City by the State of California and named it “Ocean Beach Park”. This park included the 25 acres of beach and in addition another 5 acres that we have known as Saratoga Park. Houlton stated that these documents are public and were filed by the OBCDC when they filed their application for the Veteran’s Plaza. These disclosures surrounding the park / beach dedication in 1964 led to discussion of the differences between a “dedicated” park and a “designated” park, that Ocean Beach Park is the name for the entire beach including the grassy area – and the intent was just to rename the grassy area, and other ideas such as perhaps simply naming the children’s play area after Held. Finally Board chair John Ambert, after Jane Gawronski agreed to withdraw her motion, and after Dave Martin agreed to take the issue back to his OBCDC board, tabled the issue to the next planning board meeting to give the Board a chance to review all the documents submitted by Houlton. In other news from the OB Planning Board, there was a discussion on the status of the OB Community Plan Update and its journey to the Calif Coastal Commission this week – with pleas for OBceans to attend the Commission hearing on Thursday, Aug. 13. The Board also approved the designs for the Ocean Beach Plaza. The Board also approved by a vote of 8 to 1 a new project at 4736 Niagara, as the owners wish to build a 1 bedroom apartment above a 2-car garage off the alley – as the older cottage in that space had partially burned. The structure will only be 26 feet in height. I personally think the children’s play area is a bad idea. It will be vandalized constantly and take away area from people just looking to relax, kick around a soccer ball or do some yoga. Going to the beach shouldn’t require some form of entertainment to make it enjoyable. I have to agree with da john, why do you need a children’s play area at the beach, the beach is one big playground. And, yes, I have cildren. I second that Da John! IfOcean Beach has very little in the way of playground area, and lots in the way of Soccer and Yoga space. I think it’s a great idea. Then again, I have kids (even thought they will probably be to old to use the playground by the time it gets built). Lots of room to kick your soccer ball and do yoga next to the Lifeguard Station. Or that tiny little place known as Robb Field. I think Robb field would be a fine place for a new playground. Plenty of parking and usually a cop sitting in one of the parking lots to keep an eye out. it wouldn’t take up any precious beach front space either. Do you have children Ja John? What kind of question is that? Should I be excluded from having an opinion about a development in the neighborhood I live in just because I’m not a direct beneficiary of the development under discussion? It’s a direct question. From your response- it seems you have not. I am not projecting my on experience upon you- only my own. Before I had kids, I never really thought about them and their needs. Once I did, I tended to think a little larger- and about those around me instead of being self absorbed. Like I said before- I support this playground, even though I know my kids will be to old to utilize it before it gets built. The fact remains that there would be plenty of space to chill out, do yoga and kick a soccer ball at the beach if there was a playground. And the space required for 2 people kicking a soccer ball is considerably larger than 2 on swings. Look at the beachfront playground in La Jolla, of the one in Liberty Station, or Mission Bay. Those are the most utilized per square foot spaces in those parks. Same with Ebers Street Park. Everyone should have a voice- including the children not old enough to voice it and those yet to come. If you did have small children then you’d realize that a playground would benefit the community. I live in South OB, do you really think that I want to walk all the way down to the other side of OB to go to Rob Field? No, and if I did, I’d go to Dusty Roads since there is all ready a playground there. Having a playground at the beach is a wonderful idea. Imperial, Coronado, PB, La Jolla, Solana Beach, & Encinitas all have playgrounds at their beaches. Why can’t OB? Playgrounds in City Parks are required by the city to have staff to monitor and ensure safety. It is unknown if the lifeguards are willing to take this responsibility. The children’s playground started as a “Tot-Lot”, but has been renamed to “children’s playground.” When we see what is proposed in more detail, everyone will have a better idea of what is going on. The acknowledged Tot-Lot today is at the OB Rec Center. 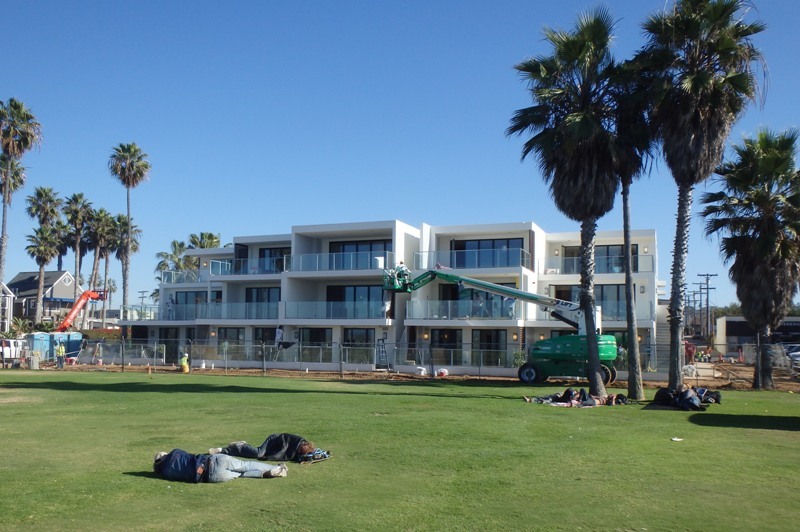 Robb Field is officially part of Mission Bay Park, but also has staff to comply with the rules. I’ve lived here a long time w family and friends and plenty of kids and we all used and still use Saratoga park as is. It needs no improvement. Please can we just leave one thing alone in OB. If it’s not broke don’t fix it! Peace! I could not agree more, Richard. I cannot understand this obsession with ordering every single piece of open space available. Whatever happened to enjoying open space, using your imagination, bringing your fun. Playgrounds are great for places where there isn’t much else to do. The beach doesn’t need a playground or an adult fitness set up. And how is the argument that other beaches have these things an argument. So OB needs to look like every other beach now? An adult fitness set up? The sand and water are great workouts. If OB had a lot of open space at the beach, this wouldn’t be a big deal but it has a very small amount of this space. Let’s leave it alone and let people enjoy it they way they have been for a hundred years.